Michael J. 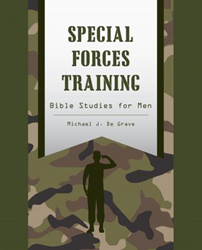 De Grave’s new book Special Forces Training ($10.99, paperback, 9781498465373; $5.99, eBook, 9781498465380) is an excellent disciplining tool designed to train and equip men to become leaders in their families, churches, and communities. As boot camp and basic training are to becoming a soldier, so Special Forces Training Bible Studies for Men is essential to learning and developing principles for leadership in the Kingdom of God. These studies, written in the style of a military training manual, will change men's thinking about the call and character of God. Men will discover the calling of God on their lives and want to enlist for active duty in the Kingdom. Michael J. De Grave holds a Bachelor's Degree in Ministry from Shalom Bible College and Seminary, Des Moines, Iowa. He is the founder and senior pastor at De Grave Ministries, Inc. Special Forces Training Bible Studies for Men was developed through three years of men's ministry at an inner city church, and two years of fine tuning. As a pastor, published author and composer, teacher, speaker, and writer, he witnessed this series of studies successfully help men at all stages of their lives, developing their skills in studying the word of God and becoming leaders in their families, churches, and communities. Xulon Press, a division of Salem Media Group, is the world’s largest Christian self-publisher, with more than 12,000 titles published to date. Retailers may order Special Forces Training through Ingram Book Company and/or Spring Arbor Book Distributors. The book is available online through xulonpress.com/bookstore, amazon.com, and barnesandnoble.com.